Choosing a date, and then getting confirmed availability is a great starting point. Once you have this confirmed, the rest of the planning will follow fairly easily. You do not need to wait until every other detail is planned before agreeing on a date. Make sure you consider weather expectations and seasons when choosing a date. Make sure to finalise who will be hiking with you in advance. Make sure the people you invite are suitably fit and experienced for the route you have chosen. The minimum Scout hiking party size is 4. Arrange transport to and from the start and end points. Ensure that the vehicles have sufficient space for your backpacks, staves and other equipment. Are you budgeting for transport costs, or are parents volunteering? Create a suitable hiking menu that is easy to prepare, and provides sufficient energy and sustenance for hiking. You should also keep emergency rations. Create a personal kit list and send it to each member of your hiking party. You can also divide up group kit between you. Suitable shoes for hiking/walking. Wearing of thick socks is recommended. Food (provided, or each bring their own? 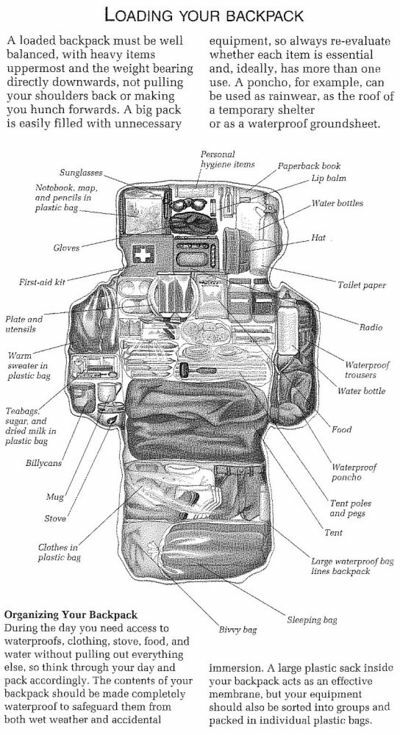 It is important to pack your backpack correctly to avoid early fatigue and discomfort. Check out these videos for some tips. See How to create a budget for scout activities for more details. Have a look at this important section on Hiking Safety. 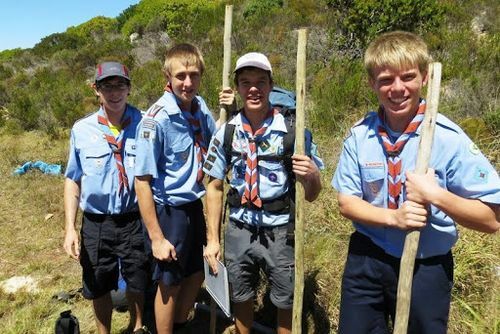 Logbooks of hikes are required for the Springbok Scout and the Hiker Interest Badge. Written logs may also be presented for Adventurer Day Journey and First Class Hike. How to Write a Hiking Log is a guide to Scouts on how to write these logs. See Trails and Tracking for details. During the first hour collect items for a nature logbook e.g. seeds, leaves, flowers, feathers, etc. The collection must have due regard to the Outdoor Code. In the next hour spot and identify at least 5 different trees, bushes, birds, animals, insects etc. Make a note of these. Take regular note of cloud formations and wind direction throughout the journey. Demonstrate an ability to use a compass or point out the general direction in which they are hiking according to the eight cardinal points. Stop for a meal or refreshment at a place where the Scouts can prepare a meal - it is recommended that the making of a fire and the cooking of an item of food, e.g. boerewors, meat, mealie meal, etc. be undertaken. Allow at least 75 minutes. Keep written notes of what is observed on the way for easy reference when reporting back later. During the hike look for possible areas of soil erosion, water pollution, or vandalism of property which may be corrected in a future Troop conservation project. This page was last modified on 6 September 2018, at 10:05.